Yet, there were significant differences in performance across the different members of the sales team. This brought home to me the people element of any business capability – there are elements of people’s skills, knowledge, experience, attitude and behaviour which influence how successful they are in their roles. No amount of process improvement or systems improvement or supporting IT tools would make any difference for some individuals. It was not longer after this that I started an assignment with another client, where we were engaged to develop a high level business and technology architecture, gap analysis and roadmap for business and technology initiatives to improve the performance of a division involved in major infrastructure projects. The Executive had already determined the key business initiatives but had not assessed where technology could best contribute. This proved to be an important initial assessment, as there were a number of initiatives where the information systems were regarded as highly suitable, but attention needed to be given to business practices. This allowed us to direct more time and attention to deficiencies in business process and information systems, and for the Executives to attend to improvements in business practice. A few years later, two different clients required assistance in developing business and technology architectures, assessing critical gaps and developing associated business and systems transformation roadmaps. It was at this point that we developed the following visual for prompting conversations with business executives around the composition of their business capabilities and the nature of the deficiencies that were impacting on their business performance. This could be developed further, going from a qualitative assessment to a more quantitative approach. In all likelihood, such analysis is more likely to be part of the development of a detailed business case than in the broad assessment of capability gaps for development of transformation strategies and plans. Irrespective of these issues, this approach to exploring different dimensions and perspectives as to the deficiencies of business capabilities has proven to be very helpful to a wide range of business executives. It has been particularly helpful in opening their eyes to the possibility that significant business improvement may be achieved through quite small investments in improving business practices rather than the normally large investments required in improving business processes and supporting IT systems. This was borne out again in a recent client situation where there were significant concerns about the delays in generating employment contracts. Initially, the HR Executive and IT Executive started exploring the need to integrate a recruitment system and a payroll system. As early analysis was undertaken, it was determined that the delays were attributable to the manner in which requests were prioritised and allocated, and that a change in the organisation of staff and in the triaging of incoming requests would make a far greater improvement than any initiative to integrate the two systems. This is not meant to imply that IT systems cannot make a difference – simply to make clear that other factors can be more significant, and that there is a need to understand the business-system-in-focus and options for improving its performance. Such an approach requires the business architect or business analyst involved to appreciate the distinction between the business system and any supporting IT systems. 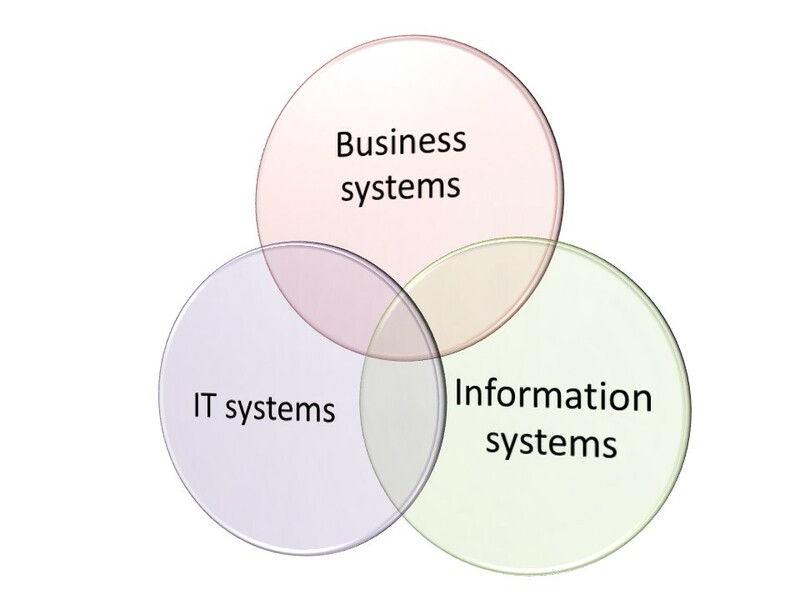 This article has been developed to further elaborate on the manner in which being clear about the distinction between business systems, information systems and IT systems is important and of value to business stakeholders and business improvement project members, first introduced in the article “Trinity of systems”.